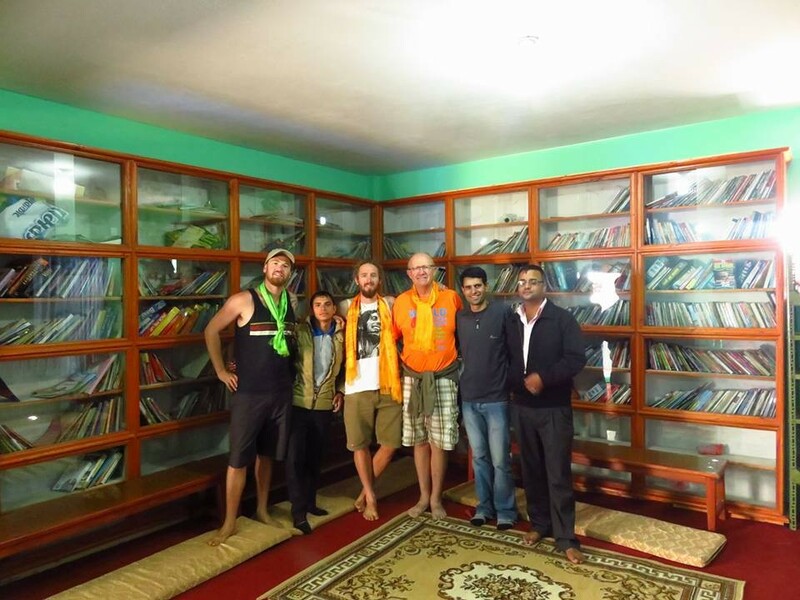 Not long after the successful opening day of the Active Hearts Sadtobate library Dan and Arjun started to look into the next project. Fundraising and promoting the charity has its own challenges, but they were finding that a huge amount of effort must be put into researching, visiting and consulting, then planning out exactly how each project will run. 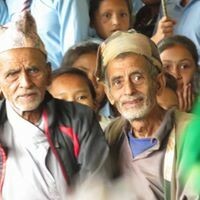 Almost every village in Nepal has many issues and projects that Active Hearts could address and assist with. How do we narrow the options down to something beneficial to the most people, that is manageable by us and will not upset the sometimes delicate village social and cultural considerations? Not to mention creating problems with local government or other NGOs in the area. The answer is simple. Active Hearts has an inside backstage pass to these remote areas through our local connections. Central to this is Arjun Adhikari. 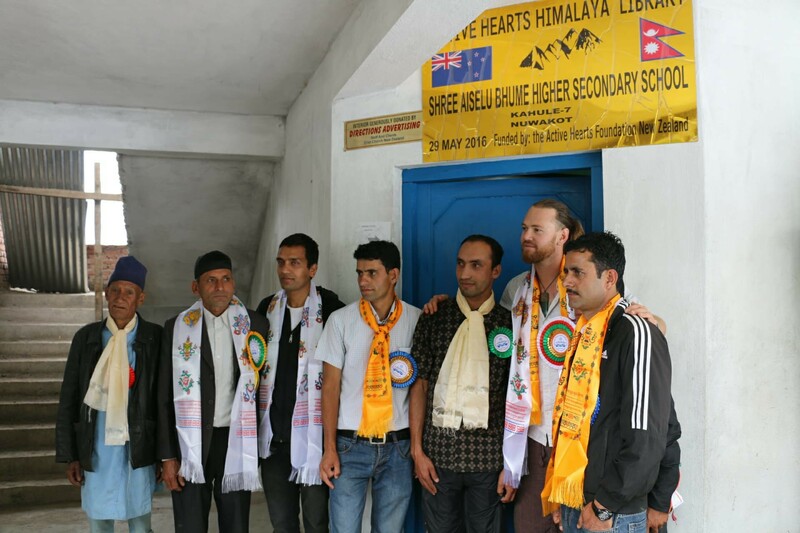 Arjun is a co-founder of Active Hearts and is highly educated through the Nepali schooling system and internationally through six years spent working in Malaysia and five years working with New Zealand based Himalayan trekking company Active Adventures. 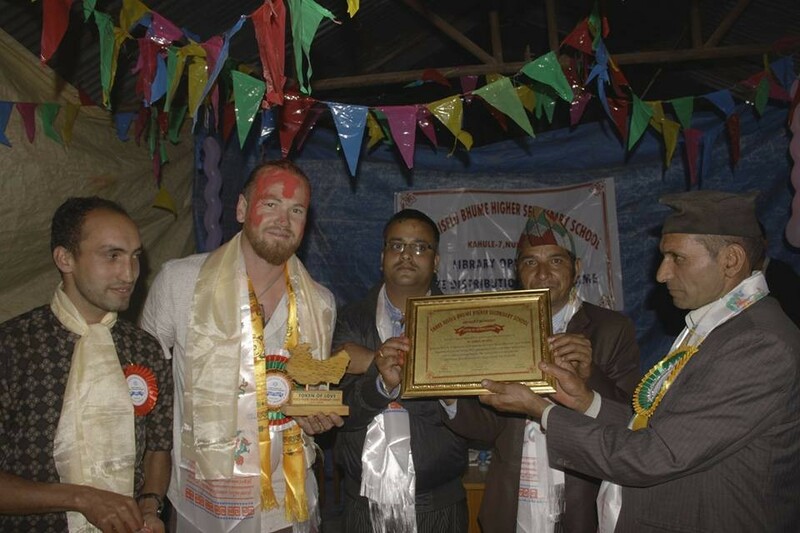 He is a lead guide with Active Adventures and a village leader in the Nuwakot district. Through Arjun's intimate knowledge of Nepali culture, education system and social issues we have the great advantage of finding the right project and conducting our services in the right way. 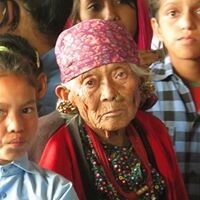 Through our partner trekking company Earthbound Expeditions, based in Kathmandu and owned by Rajan Simkhada, along with his network of guides and porters, we have a vast number of contacts throughout Nepal. This is how we came to find Shree Aiselu Bhume Higher Secondary School. Kahule village is nestled in the picturesque Nuwakot district in the foothills of the Ganesh Himal mountains. It is a very poor area with people predominantly of Tamang decent. It was hit extremely hard by the earthquakes and 16 of the 20 classrooms in the local school were flattened. Arjun and Dan, along with Kelsey, Dee, Kate, Mel and Shree visited the school Nov 12 2015 to meet the principal and teachers and see the damage. It is quite shocking to see the collapsed destroyed buildings and the makeshift offices and classrooms first hand. Luckily for this area UNICEF had paid for locally made bamboo structures to be built as temporary classrooms. The school role is about 600 students and some will walk for 1.5hrs to come to class. A small very basic library was in existence but consisted of a few very outdated books not relevant to the school curriculum. 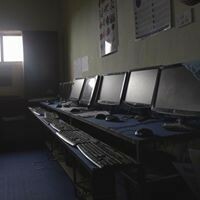 The small number of computers were rendered useless by the quakes. 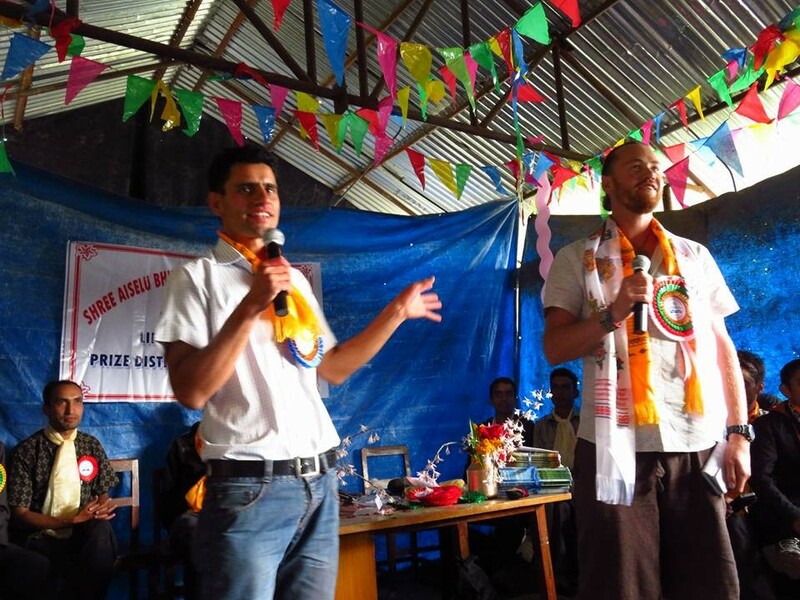 Dan and Arjun quickly came to the conclusion that Shree Aiselu Bhume Higher Secondary School desperately needed our assistance. Plans were made to use one of the remaining concrete classrooms as the new library room. The principal provided a list of approximately 1000 curriculum related books that the teachers needed. 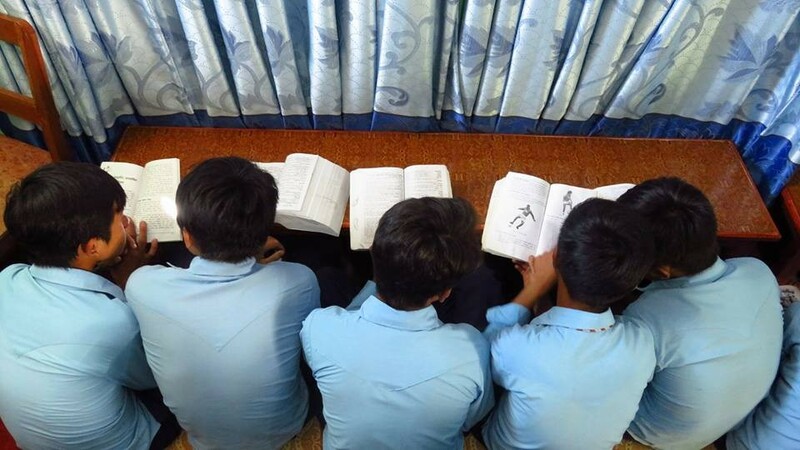 Arjun and Dan would source the books in Kathmandu along with 4 new computers to further the students' computer studies. 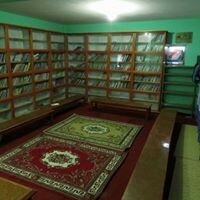 Local craftmen would build the bookshelves, lay the carpet, hang the curtains and paint the room. Tables would be built and we would provide sitting mats for the children plus the librarian's desk and chair. 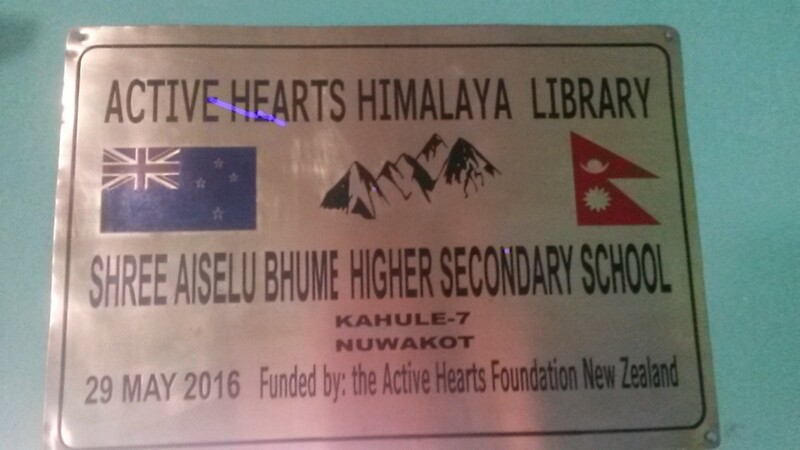 The librarian's salary would be paid by Active Hearts to ensure efficient operation of the library. 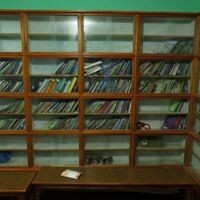 The total cost of our latest library came to be about $7000 USD. As we began our fundraising campaignDan's good friend Mark Wilson from New Zealand, made contact. Mark had recently hiked the Active Hearts charity trek for 10 days through the lower Solu Khumbu region with Active Hearts on our Charity trek. Marks parents Jeremy and Julie Wilson own Directions Advertising, an advertising company based out of Christchurch, New Zealand. They wanted to give their clients something extra special that Christmas, something with real meaning. They wanted to sponser an Active Hearts project on behalf of their clients. After discussing options with Dan, Julie and Jeremy very generously chose to donate the $3000USD needed to renovate the interior of the new library. This was an extremely selfless offer and we are very grateful to Jeremy, Julie and Mark for their support. 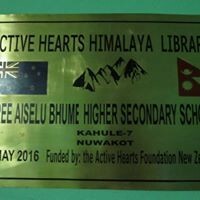 The total cost of the latest library came to about $7000USD. Please contact us if you think you or your business may like to sponser a project. Six months later the library refit was complete, the books were stacked and the computers were in place. Dan, Arjun, Mel and a small group of the Active Hearts team wound their way back into the mountains to Kahule village. The monsoon was late arriving in 2016 meaning much of the corn crop was very late to be planted. The day before the grand opening on May 29 2016 the rains came. Unfortunately, this meant the large ceremony planned had to be downsized to fit inside an earthquake damaged building but we were more grateful that the much needed rains had finally arrived. Never the less it was a wonderful day! We were very spoilt by the school and the village. 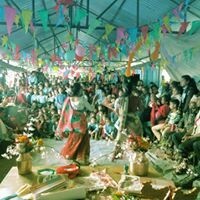 A delicious dal bhat feast was had then the afternoon was filled with song, dance and speeches. The new library looked amazing and the new computers were sitting proud. We can't thank our donors enough, especially the team from Directions Advertising for their very generous donation. We also had a new member on the Hearts team accompany us. Mr Babin Dulal is a film student at the Kathmandu film school. Dan had put out the word we wanted someone to help document and share the Hearts' story. Babin was recommended by his professor and agreed to come for the opening. We couldn't have found a better man to join the crew. He took hundreds of great photos and many hours of video footage.